At this point, I no longer recommend a bunch of $5 – $10 solutions, and what you’ll find below are tools that pay for themselves 5-10x month after month. Paying for real tools also helps force you to take your business seriously and try to grow each month… because you have bills to pay. I use WPengine. With most other hosting solutions, at some point you will either have to 1) become a semi-expert yourself in cPanel/WHM or 2) hire someone who is, just to run your site and deal with problems that pop up. 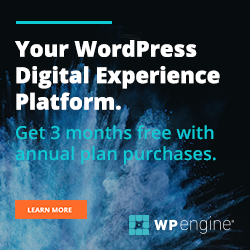 With WPengine, each site you setup is cleanly and completely separated from the others, and you have a built-in staging environment to test updates before you blindly update your real site and then panic as you realize you crashed it (again). Their support is great, and right off the bat your site will score really high on Google page speed tests. Well worth the slightly higher monthly price. Oh and it has SSL built-in, and you get the Genesis framework and all StudioPress themes included for free. I use ActiveCampaign. There are obviously a lot of choices out there, and at this point a lot of them can do amazing things. ActiveCampaign excels at the highest-leverage email marketing strategies: sending email, integrations, and tagging/segmenting your list(s). In your section, “Getting Backlinks”, are you saying that the links you’ll get from Build My Rank are a lot Better than what you’ll get from Unique Article Wizard? Gene- They’re very different. BMR links are definitely higher quality, but they take way more time to build than UAW links. UAW links can’t be beat for Youtube videos- they get Youtube videos ranked highly pretty much everytime. In on of your videos I noticed you editing a post in word press and in addition to the TinyMCEAdvanced editing buttons there seemed to be what looked like cool in color checkmark buttons. What plugin is that?! Bob- It’s actually just built into Profits Theme. It is a cool feature, and the other thing that’s awesome is the different color-text-boxes you can insert into posts with either solid borders or dashed borders. Hey Nate, just wondering what you think of Brad Callens Article Submitter and his SEO Elite? Have you heard of em and do you have any input about em? Thanks Nate. Sorry Nate, forgot to ask one more thing in my previous post: Also was wondering if you’ve heard of HeatMap Theme for WP and if ya have, what you think of it also. Thanks again. Shaun- I don’t know anything about those services you mentioned. If you use them and they’re working for you then that’s all that matters. I know that some people sign up for as many link services as they can but that’s usually overkill… so I’ve never really looked past the services that I started getting results with- although I am trying Link Authority and ArticleRanks right now since BMR passed away. About the bonus video course on icontact – Is it just a course on using icontact itself or does it go into some more about list building? It’s mostly a walkthrough of setting up your first campaign: freebie, welcome email, and optin form. Hi, please tell me what is the best Amazon oriented WP Theme that you use beside Profits Theme. As i see Profits Theme is more squeeze page oriented. Paul- I use Profits Theme on all my sites.. I don’t have a certain one for just Amazon sites. It’s highly customizable- even with just its regular blog settings it’s easy to get a site to look how I want it. Yes Nate, I was wondering about Profits Theme. Looking at the sales page it is all about Squeeze pages, membership sites etc. Are you saying that it is still worth buying Profits Theme, even if we are not using most of the functions. Robert- I think it is, simply because you can use it for any type of site, and since it’s an unlimited license, once you get to where you need a squeeze page or sales page, you have that functionality at no added cost. Yes, I can see your point, thanks for the reply. Do you know if Profits theme ever go on sale or offer a discount of any sort? I really like the look of it, but don’t have $97 for it right now. Lori- The only sale I’ve seen them do was their 1 year anniversary of releasing it… I don’t know if they’ll do that again or not. how much does niche profit classroom costs? is it one time payment or monthly payment? There’s a $1 trial, and then it’s $67 a month for as long as you want access to it. thanks.. i have a question about the keyword tool.. between market samurai and longtail pro. If i have to choose one, which one would you recommend me? Is market samurai still process as fast as last time or it takes long time to load? I would choose Market Samurai if you just get one. I use MS for 95% of my keyword research- it’s just a lot faster. What about traffic Travis and the best spinner I heard they are good as well. Have you ever tried them. I’ve tried Traffic Travis and it was good- but day to day I end up using Market Samurai by far the most. All I can say is, I wish I would have picked this up when I first heard you mention it! Straight out of the box it looked better and was easier to use than that damn (other name not mentioned) $97. Clickbank theme I had nothing but hassles with for the last 6+ months. Natalie- Good to hear. I’ve had nothing but a great experience with Profits Theme over the last year and a half. Thanks for getting it through my link- I appreciate it. Hey Nate!, thanks for sharing all these awesome tools. Look, I’m working on a blog for Spanish Speaker Readers and I was wondering how can you know that someone used your link to make a purchase so you can offer your support, as you offered above?. I mean, that’s an excellent way to encourage people to use your affiliate link, but how can the purchaser demonstrate that he/she used and purchased from YOUR link?, how can you control that?. Thanks so much for your help!! !